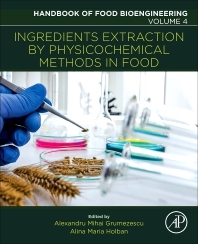 Ingredients Extraction by Physico-chemical Methods, Volume Four, the latest release in the Handbook of Food Bioengineering series, reveals the most investigated extraction methods of ingredients and their impact on the food industry. This resource describes types of ingredients that may be extracted through physico-chemical methods (i.e. specific plants, fruits, spices, etc. ), along with their particularities to help readers understand their biological effect and solve research problems. The extraction methods of bioactive compounds and functional ingredients are discussed, along with information on green ingredient extraction strategies to help reduce harmful environmental and health effects. Extraction methods in this book can be applied for multiple purposes within the food industry, such as ingredients separation for food development, the purification and separation of toxic compounds from a food mixture, and the recovery of natural bioactive compounds. Dr. Grumezescu is Assistant Professor at the Department of Science and Engineering of Oxide Materials and Nanomaterials, in the Faculty of Applied Chemistry and Materials Science, with a second affiliation to the Faculty of Medical Engineering, at the Politehnica University of Bucharest in Romania. He is an experienced and oft-published researcher and editor in the field of nano and biomaterials, and he is the Editor-in-Chief of three journals: Biointerface Research in Applied Chemistry, Letters and Applied NanoBioScience, and Biomaterials and Tissue Engineering Bulletin. He also serves as editor or guest editor for several notable journals. Dr. Grumezescu has published 150 peer-reviewed papers, 20 book chapters, 6 co-authored books and 11 edited books.